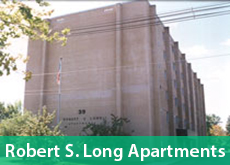 Robert S. Long Apartments participates in a program where aides are assigned to each senior building if resident qualifies. The Plattsburgh Housing Authority offers a full-time maintenance service. There is an employee assigned to each complex. During office hours, any work item that needs to be done must be called into the maintenance office. Work orders are computer generated and are given to an assigned maintenance worker. All work orders are addressed in a timely manner allowing for emergency items first. Each high-rise has a community room with cable television, a computer (w/ internet access), a kitchen area, and various scheduled events. Community rooms may be reserved by the residents for special events.